Cardiovascular disease is a major cause of mortality in the western world and about half of these deaths are caused by coronary artery disease. One of the most commonly used interventions to treat arterial blockages is to deploy an arterial stent to keep the vessel open. Traditionally, some cardiovascular stents have been associated with serious side-effects, such as thrombosis. This book describes the fundamentals of cardiovascular stents, technologies to functionalize their surfaces and the market status of these important implants. 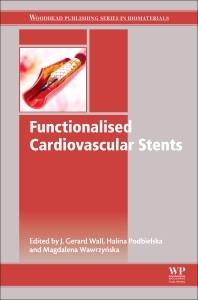 The chapters provide specific focus on the production and evolution of cardiovascular stents, providing essential knowledge for researchers on advances in the field and knowledge of how cardiovascular stents are currently being "functionalized" in order to improve their biocompatibility and minimize negative outcomes in vivo. Dr. Gerard Wall obtained his primary degree in Microbiology from the National University of Ireland, Galway, followed by a PhD in Molecular Immunology from the University of Aberdeen, Scotland. After a period spent engineering antibodies at the University of Zurich in Switzerland, he established his own research group in protein engineering at the University of Limerick, Ireland. He returned to NUI Galway in 2008 and is based in Microbiology and the Centre for Research in Medical Devices (CÚRAM). He has published widely on recombinant protein expression and engineering and has particular interests in the fields of antibody engineering, drug delivery, and materials functionalization. Prof. Dr. Eng. MD Halina Podbielska received her M.Sc. and Engineering Degree in Applied Physics/Optics from the Faculty of Fundamental Problems of Technology of Wroclaw University of Science and Technology (WrUST), and her Ph.D. degree in Physics from the Institute of Physics at WrUST. She also received her M.D. degree from the Faculty of Medicine of Medical University of Wrocław. In 2002 she received the scientific title Professor of Technical Science in Biomedical Engineering. She was a visiting scientist in several scientific institutions worldwide: as an A. v. Humboldt fellow at the University of Frankfurt/Main, University of Muenster (Germany) and at the Weizmann Institute of Science, Israel. In years 2002-2005 she was a visiting professor at the Institute of Optics of Technical University in Berlin. She was also visiting scientist at the Charite Medizin University of Berlin (2005) working at the Medical Laser Technology Center LMTB, Germany. She a member of the Academic Advisory Board and Representative of Biomedical Engineering of EPMA (European Association for Predictive, Preventive and Personalized Medicine and an associate editor of EPMA Journal. Her professional experiences include biomedical engineering with emphasis on medical application of optics, nanomaterials and physical medicine. Dr. Magdalena Wawrzyn ́ska is an interventional cardiologist and internal medicine specialist, a member of European Society of Cardiology and the European Association of Percutaneous Interventions. She obtained her M.D. degree, followed by PhD in Internal Diseases at Wrocław Medical University, Poland, and is currently an academic teacher at Wrocław Medical University and practitioning clinitian Her research focus is experimental cardiology and diagnosis and advanced treatment of coronary artery diseases. She has been awarded a silver medal at the International Exhibition of Innovation, Entrepreneurship and New Technologies, Eureka Brussels in 2006 and bronze medal at the Concours Lepine International Paris in 2016. Dr Wawrzyn ́ska is the owner of several patent applications in the field of innovative solutions for cardiology.